Use any technique that layers embossing powders. I used the technique "Cracked Glass". I added 4 layers of Ultra Thick Embossing Enamel (UTEE) to the stamped image and then bended it carefully until embossed layer cracks! Watercolor the image, Distress inks for the cracks and some drops of Glitter glue. What a fabulous technique and so unique. Absolutely stunning. 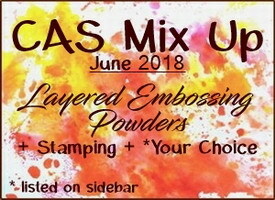 Thank you for joining in over at The CAS Mix Up Challenge. What a beautiful, vintage design, Birgit! Love the image and the glitter drops add even more interest! Thanks for sharing with us at CAS Mix Up! Fabulous approach Birgit, as usual, you always have a unique piece for us.